The Fed Funds Rate – Where to? The F.O.M.C. increased the Fed funds rate this week from 1.75-2.0% to 2.0-2.25%. In announcing this change, the F.O.M.C. 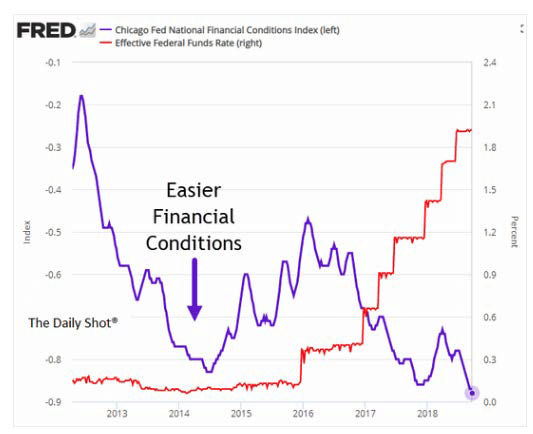 statement removed the following phrase used in prior statements: “the stance of monetary policy remains accommodative.” Despite that removal, U.S. financial conditions remain easy (see Figure 1). In our view, it seems unlikely that the Fed’s normalization efforts will begin pinching the economy before the end of 2019. It remains our long held view that the Fed will continue gradually raising the Fed funds rate to 3.0% or higher. We base that on the Fed’s current estimate for the neutral real interest rate of nearly 1%. Assuming expected inflation of over 2% that would lead to the Fed funds rate reaching over 3% by the end of 2019. To do so, would mean at least four more 25 basis point increases in the Fed funds rate by this time next year. At that level, the Fed Funds rate will likely move into a more restrictive mode. 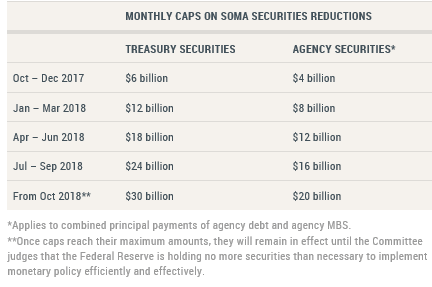 Starting in October, the Fed will limit its balance sheet reinvestment to a runoff of Treasury and Agency securities that exceeds $50 billion monthly or potentially $600 billion annually (see Figure 2). At the new higher cap, the Fed, for the first time, will likely no longer regularly act as a net buyer of Treasuries and Agency paper. Third Quarter G.D.P. – Who is Right? The Blue Chip Economists’ forecast for third quarter real G.D.P. growth averages about 3.2%. At the same time, comparing third quarter forecasts from the Atlanta and New York Feds makes for an interesting contrast. The Atlanta Fed calls for 3.6% third quarter real G.D.P. growth compared to the New York Fed’s projection of only 2.5%. I will let the reader make their own judgement as to the usefulness of these forecasts used by our central bank leaders. Buoyant Fourth Quarter G.D.P. – Guess Who Wins? Looking beyond the third quarter, the fourth quarter should benefit from what should prove to be a strong holiday season. 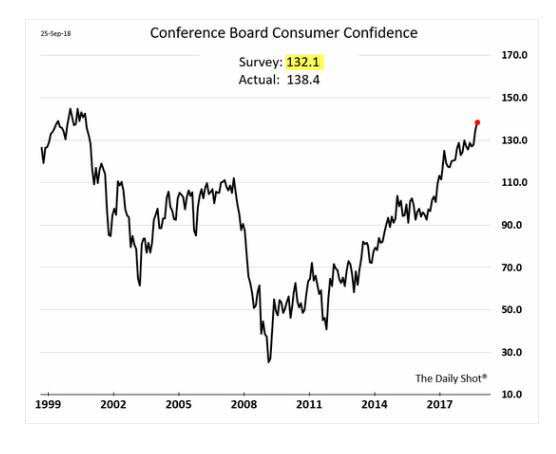 To support that outlook, the Conference Board Index of consumer confidence reached its highest level since 2000 (see Figure 3). Merchants and the leading internet retailer should be smiling at year-end. In our view, how far the year’s economic momentum will carry into 2019 will be the key question. Our long-term expectations call for the Fed to increase the Fed funds rate steadily through most of 2019. In our view, higher interest rates would begin restricting economic growth towards the end of next year. In addition, sometime in the first half of 2019, the direct stimulus effect from tax reductions and increased fiscal spending enacted earlier this year will likely end. As a result, mosteconomists expect the cliff effect of reduced fiscal stimulus and higher interest rates to result in slowing G.D.P. growth (see Figure 4 for the Fed’s median economic projections). Besides economists, the investment analysts also show more caution in their earnings estimates for the next 12 months (see Figure 5). Despite the caution, this year’s fiscal turbocharging may result in economic momentum carrying further on its own into 2019. If so, it would create upside risk for 2019 economic forecasts. With corporate profits likely to grow next year and little signs of excesses in the economy, economic growth should continue into 2020 — albeit at a slower rate if current forecasts prove correct. While not the subject of this commentary, in our view, excessive financial advantage will likely prove to be the force that brings about an economic downturn rather than traditional economic forces. 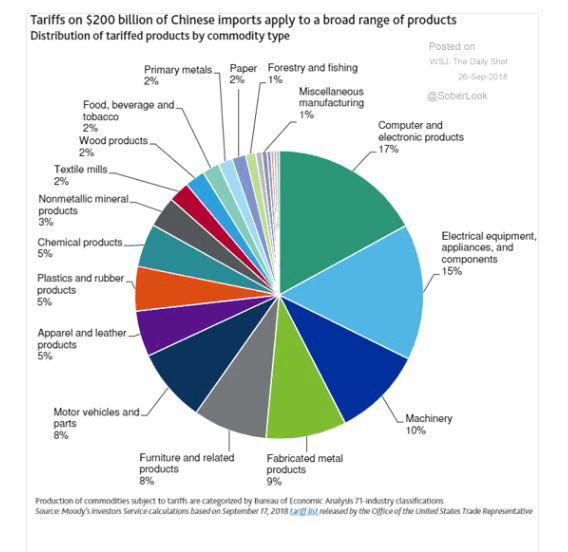 The Administration Seems to Use a Shotgun Approach to Raising Tariffs On Chinese Imports (See Figure 6). In comparison, the Chinese government approaches its strategy using more of a rifle approach. In doing so, it aims at geographic areas and voting groups that supported the President. 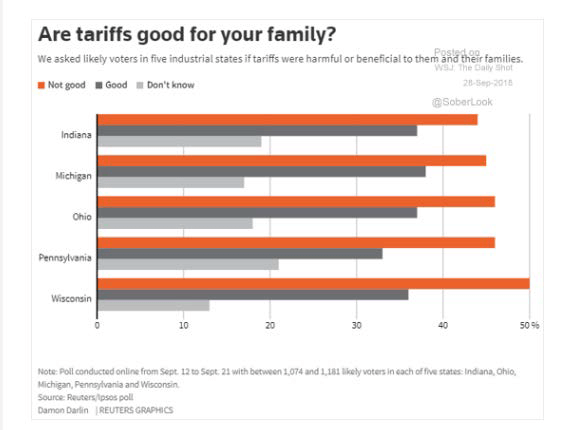 One interesting question for the mid-term elections will be whether this rifle shot approach by the Chinese will bring change to U.S. trade policies if enough red state voters swing to the blue side (see figure 8). Once we move past the mid-term elections, the presidential election year becomes Washington’s focus despite being nearly two years into the future. Assuming the President expects to run for re-election, then the need to retain or recapture his voter base may force him to readjust his trade war strategies. All of this speculation obviously depends on a red to blue voter shift in states where the Chinese government used its rifle approach. 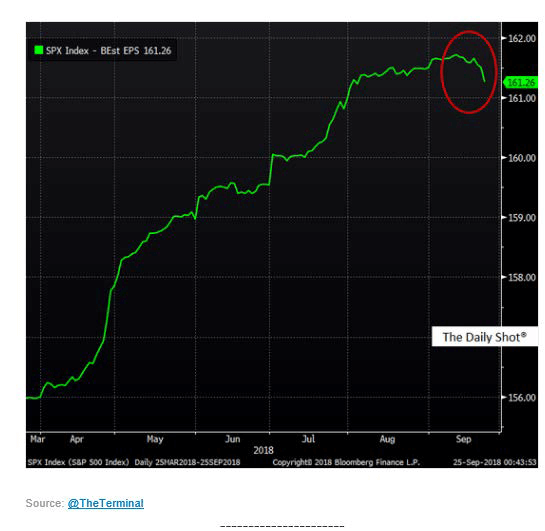 The recent weakness in emerging markets once again points out the influences on those markets from short-term rapid movements in the U.S. dollar. 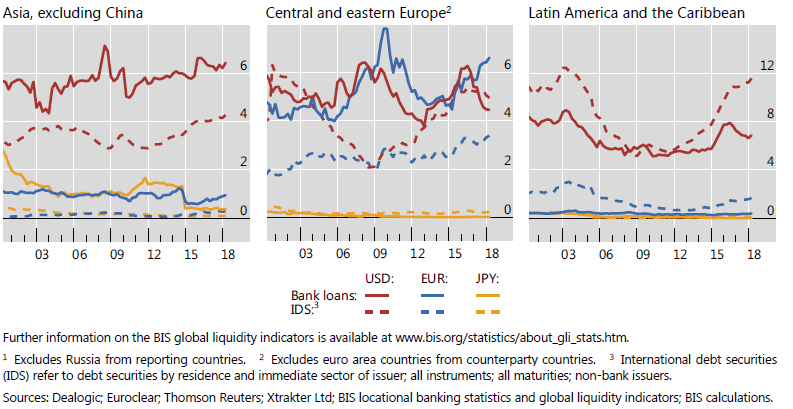 The next table shows that U.S. dollar-denominated credit in emerging markets grew at a faster rate than for other foreign currencies (see figure 9). 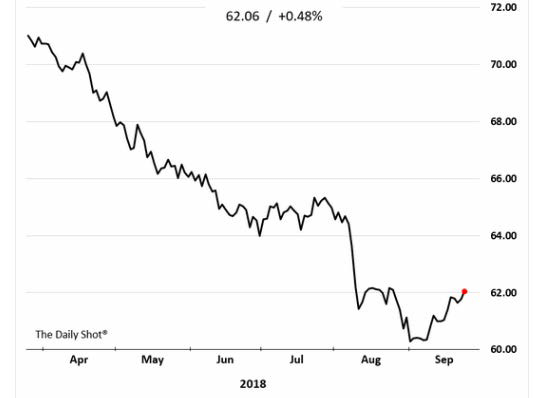 This growth partially explains the increasing importance to investors of short-term movements in the value of the U.S. dollar for emerging markets. 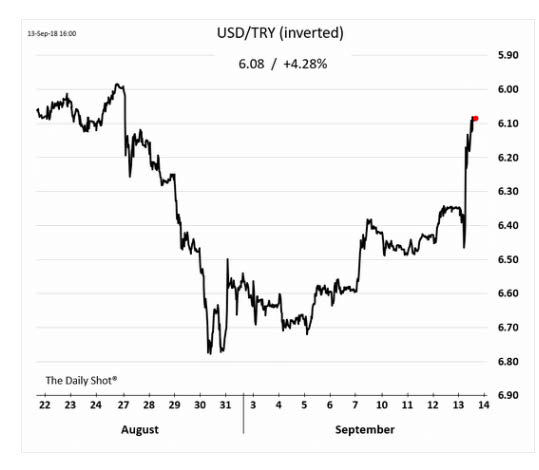 The July headlines created by the dispute between the united states and Turkey over imprisonment of a U.S. pastor surprisingly brought broad focus to emerging market debt, equities, and very important – currencies. The Turkish Lira took a sharp drop. As a result, the potential for contagion negatively affected a broad group of emerging markets. The Turkish central bank finally responded to this crisis On September 13 by raising its benchmark interest rate from 17.75% to 24%. With the Turkish bank rate increase, the Turkish Lira responded by moving up 3% against the dollar (see Figure 10). That rate increase restored short-term calm to emerging market currency trading (see Figure 11). However, without resolution of the trade wars, long-term recovery of emerging markets could prove to be limited. Despite all the noise coming out of our so-called political capital, the American economy shows continued robustness. Consumers reflect that strength with very positive attitudes. Merchants should enjoy a buoyant holiday season. At the same time, investors ask how long can the good times last? Their concerns reflect the end of turbocharged fiscal policies, continued Fed fund rate increases, and unknown endings to the trade wars. Add to that stew, Washington craziness that will grow, if that can be possible, over the next two years leading up to the presidential election. We continue to remain of the view that monetary policy normalization will begin to bite towards the end of next year. At the same time we recognize, the economic momentum may carry the current economic strength further into 2019 than economic projections currently suggest. With this combination of pluses and minuses, we expect the power of Fed normalization policies will be the ultimate influence tempering the economy and financial markets. Emerging market countries can recently attest to the power of those Fed policies. With the likelihood of a slowing economy, in our view, growth equities will receive a premium until signs of a recession begin to show up. With all that as background, we continue to recommend a diversified balanced portfolio of equities, short duration fixed income securities, and alternative investments.